Every morning my girls phone my folks from the “school bus” aka the backseat of my car. They chat to Nan and Pop about what’s planned for today and generally shoot the breeze. 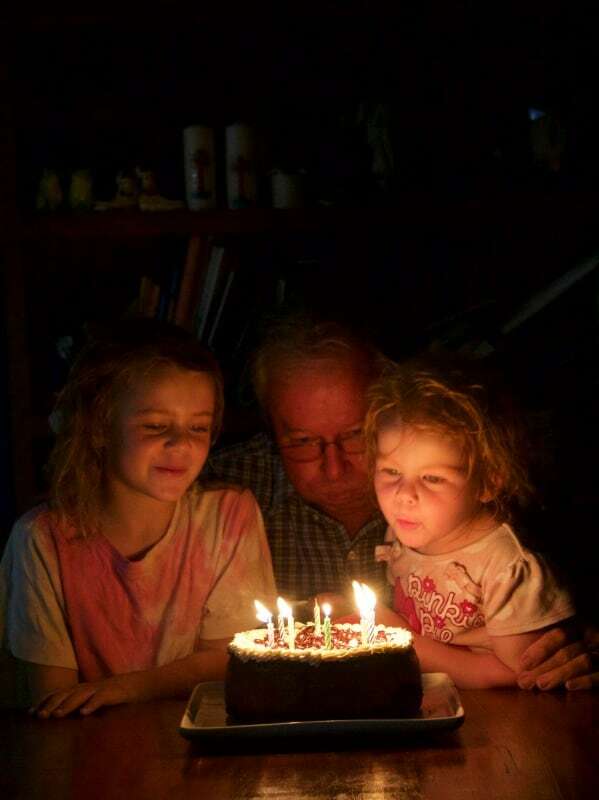 Last month, we invited Nan and Pop up for a belated birthday celebration. The girls were chatting excitedly with Poppy in the backseat. What kind of cake would you like Poppy? It’s an age old question. In fact the same debate happened on my Facebook page back in January (except with considered, humorous arguments and much less shouting). And so it went, with Poppy unable to get a word in while the girls argued his preference in the backseat. Eventually they quietened enough to hear Poppy’s compromise. 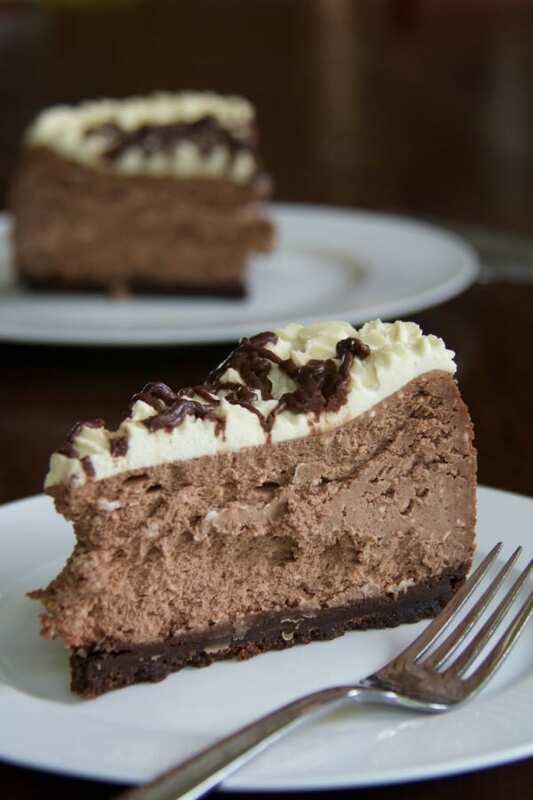 What about a chocolate cheesecake? 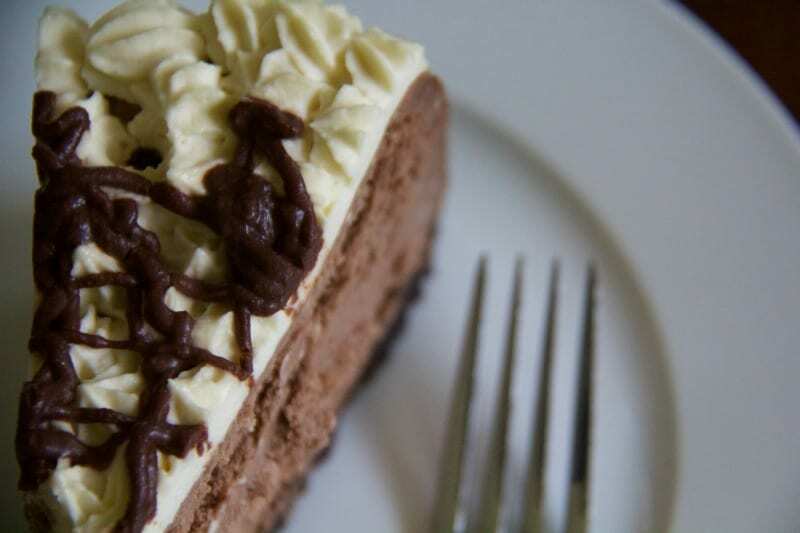 And so, I shelved my days plans and set about creating a baked chocolate rum cheesecake. Line the base of a 25cm springform tin with baking paper. (Leave enough baking paper overlap to use as a handle when removing the cake from the base of the springform tin.) Mix the melted butter and biscuit crumbs until well blended, then press firmly into the base of the tin. Bake at 180C for 10 minutes. Beat the cream cheese and sugar using a stand mixer or electric beater until smooth. Then add the cocoa, vanilla bean paste, rum, eggs, sour cream and half the melted chocolate and whisk again until smooth and creamy. 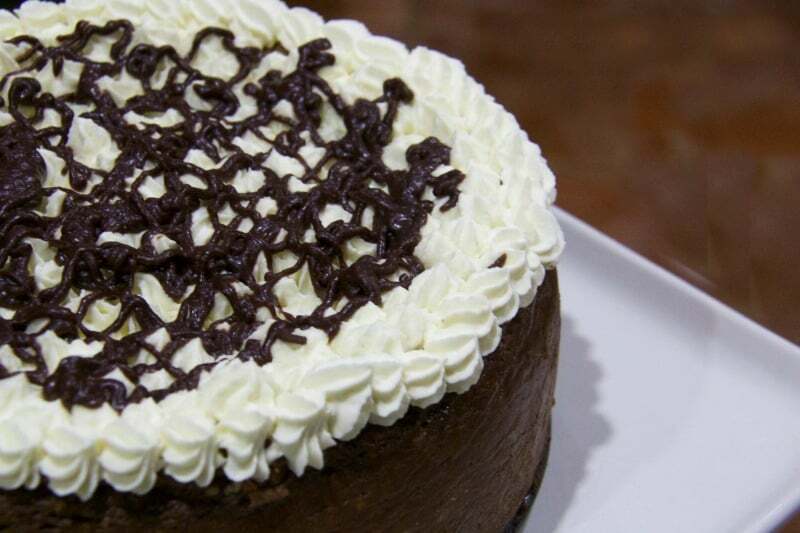 To the remaining melted chocolate, add enough milk to make a sauce consistency and save for decorating the finished cheesecake. Grease the sides of the springform pan, then pour in the cheese cake mixture. Smooth the top and bake for ten minutes at 240C. After ten minutes reduce the heat to 110C and bake for 45 minutes. The filling should be set, but slightly wobbly in the centre. Turn off the oven, open the door and leave the cake to cool for two hours (this will prevent the cake from cracking). Refrigerate until serving. To decorate the cheesecake, while the cream until it holds it’s shape then pipe it onto the top of the cheesecake. Top the piped cream with the reserved chocolate sauce. Serve to an appreciative audience. Plating the cheesecake was farcical. I put a hole in the side of the cake trying to remove it from the spring form base. Then I tried to pipe a message in the top of the cake, but the chocolate sauce was too lumpy and it looked like I’d taken a firehose to the cake. Eventually, I went for a Blue Poles kind of approach with the icing and Poppy was none the wiser ….. until the kids told him! This is the best cake I have made all year. Despite the hefty combo of cheese and chocolate, it was deliciously light (and perhaps even better the next day). 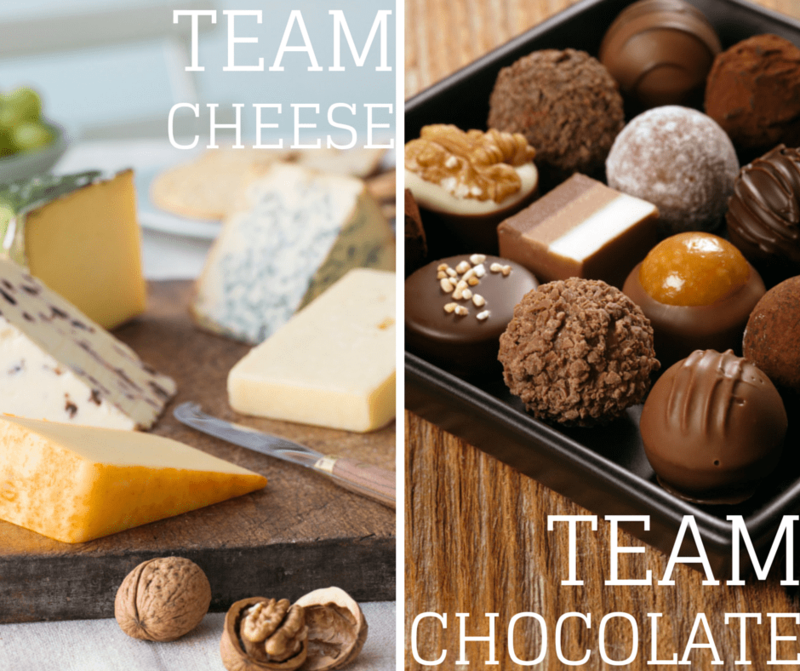 are you team cheese or team chocolate? Best of both worlds right there. I don’t think I could choose a side so I think his choice was perfect. I have a foot firmly placed in each camp, I can’t resist either of them to be honest! Well I have this in the oven as I write. I decided to try it as a pie rather than full “Cheese Cake Thickness”. The mix as show made 3 Chocolate Biscuit Crust Pies. Guess I’ll have to see how they turn out. They smell wonderful! Yum – this looks so delicious. Beautiful family photos.